… to get the button band exactly as I want it. It has been trying (just a few of the many attempts shown) but I think I’m finally there. Just got to make the thing now! Thanks for all the comments on the previous post – I’ll write in more detail about the design process for this cardigan when I’ve finished it, and if you are interested I’ll write it up and share the pattern (although it might end up being a bit of a ‘insert your own measurement here’ type of thing). I started this cardigan on Boxing Day, as my post-Christmas treat to myself. It is inspired by Elizabeth Zimmerman’s sweater of the same name, but I am working it from the top down, not using EZ’s percentage system and I have also changed the Fair Isle pattern on the yoke. 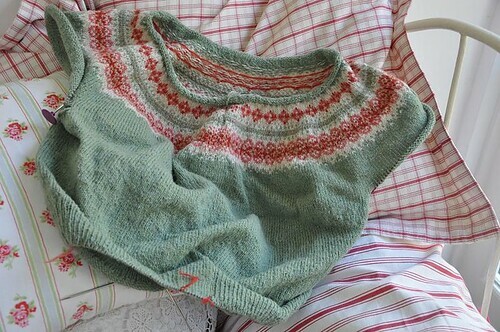 So it has sort of ended up being my Fair Isle yoke cardigan, hence the title of this post. I am mostly using 2 ply Jumper Weight yarn from Jamieson and Smith, with the red being Jamieson’s Shetland Spindrift. Both companies produce wonderful pure wool from the Shetland islands; some people express a preference for one manufacturer over the other but, to me, their yarn is equally lonely. I therefore tend to make my choice based on which one has the colours I want. This cardigan includes both short row and vertical bust darts, as well as short row shaping at the back neck. It seems to be fitting ok so far. 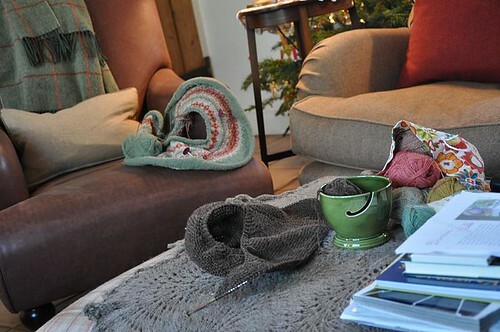 I’m knitting it in the round – it is destined to be my first attempt at steeking (aak!). I wanted the cardigan to have quite a vintage feel. So I am making it short and fairly fitted, with about 3 inches of 1×1 ribbing at the bottom. 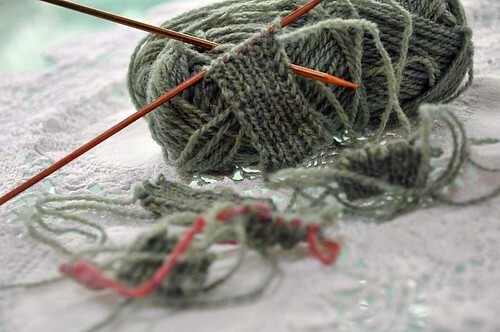 I will knit the buttonband separately and sew it on afterwards. I’m almost at the bottom now, and have just briefly paused my somewhat obsessive knitting to make a little gift for someone. I can’t wait to get back to it though! 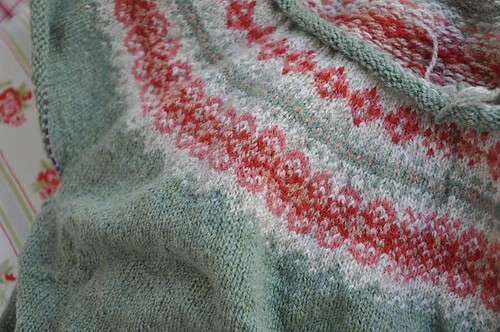 Notes: This pattern was a pleasure to knit. 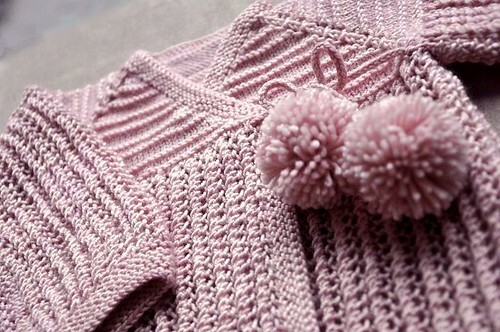 The lace pattern is easy and quick, and the whole cardigan progressed satisfyingly quickly. The i-cord ties are very sweet, and the bobbles really make increase the cuteness factor. 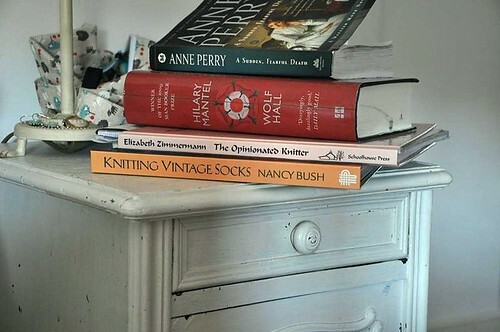 All in all, a pattern, and a book, that I highly recommend if you are in the baby-knitting market. Sonia started a meme on her blog the other day that I thought was lovely. 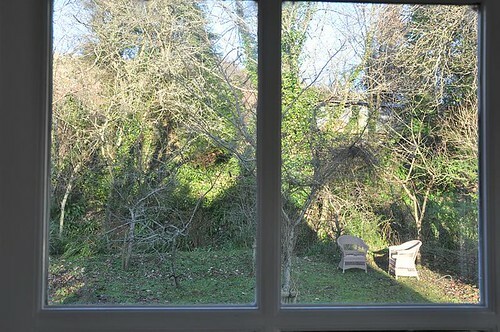 The idea is to wander around your house one day, taking photos. Nothing too staged, just how things look on that day. It’s an ‘I’ll show you mine, you show me yours’ type of thing. 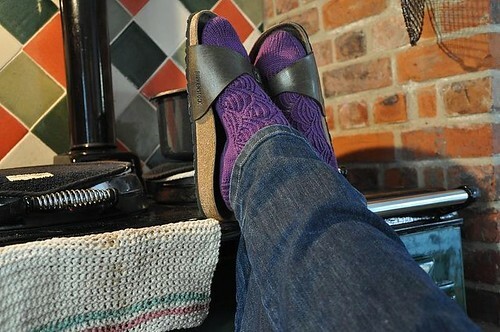 So, without further ado, here are mine. They were taken a couple of days ago, but I’m back in London and at work now, so that was my last chance to wander gently around my house for a while! So, go on, why not show us yours? Because we all like to see how other people live, right?! *Maybe I need to get out more? 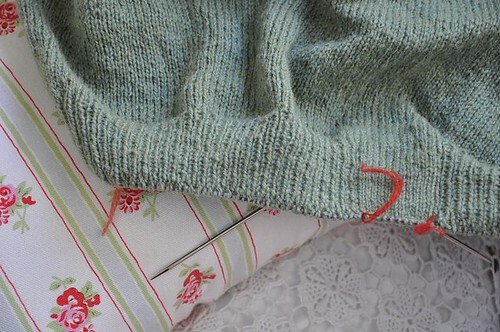 Back in June, I rather optimistically named this the Granny-a-Day blanket. I was inspired to make it by Kylie’s gorgeous blanket of the same name. Baby Ruby was due to be born in November, and I figured that if I made a square a day (easy! No problem! Right?) I should easily get it done in time for her birth. Hmm, well, I should have known better. Each square took just under an hour to make. I had originally planned to make a blanket that was 7 squares wide and 11 squares long, with a fairly wide border and finished with a pretty picot edging. But time got the better of me. 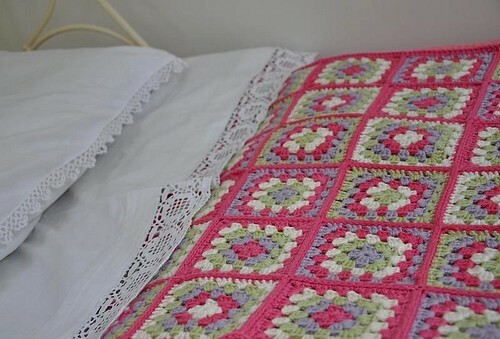 In the end I finished with a slightly smaller blanket – 60 x 10 squares with a simple double crochet border. It is just the right size for a baby cot, and I must admit that, although not exactly what I had envisioned, I am pleased with how it turned out. Yarn: A mixture of Debbie Bliss Baby Cashmerino and Rowan Cashsoft Baby DK. 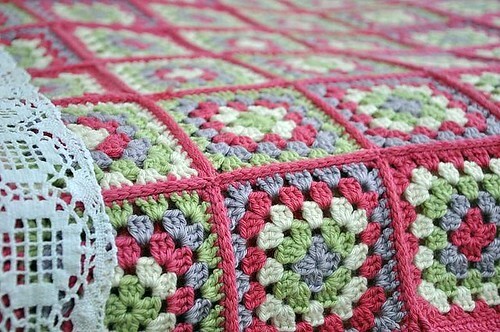 Pattern: Just a collection of crochet granny squares. 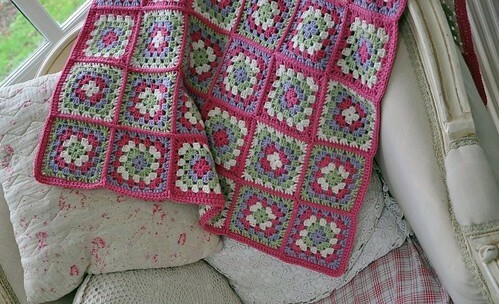 There is a great tutorial on how to make them on Crochet Cabana’s website. 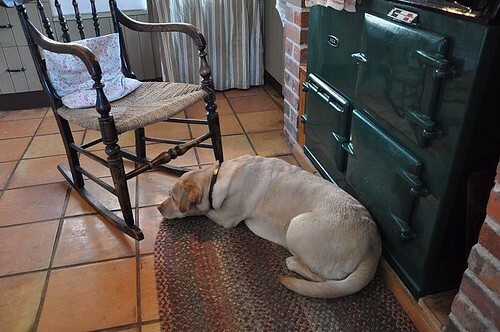 Notes: I love Asiye’s restrained use of colour in her Falsebay Baby Blanket, and decided to follow her example. 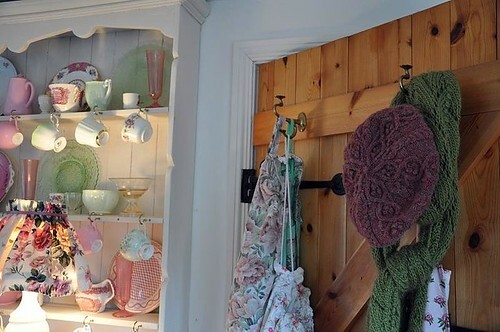 I used four colours: white, bright pink, lilac and pale green. I kept the order in which the colours progressed within each square the same, and rotated which colour was in the centre. 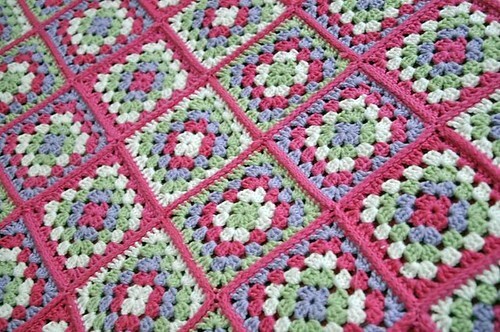 I crocheted rather than sewed the squares together. There is a good tutorial on how to do this here, although I joined mine with the wrong sides facing so that the resulting ridges were visible from the front. All in all, given: how crochet makes my wrist hurt; and that I really do prefer knitting; and that I seemed to spend every free moment towards the end doing nothing but make-more-squares; and that it still ended up smaller than I hoped; and that it ended up being a Christmas not a birth gift, I think that this blanket turned out all right!